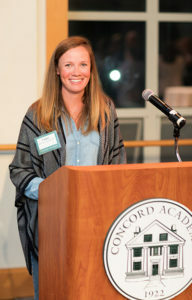 The school year opened with optimism, thanks in part to the remarkable contributions of many to the Centennial Campaign for Concord Academy, which have enabled transformative renovations and expansions to houses and common rooms, significant investments in our students and faculty, and the beginning of a major investment in Haines and Hobson houses. On October 4, we paused to give thanks — thanks to donors for their vital support and enduring belief in CA’s promise for the future, thanks for CA’s mission, and thanks for the remarkable energy we are experiencing with this campaign. Left: Fay Lampert Shutzer ’65 and Drew Gilpin Faust ’64; right: touring the newly expanded Bradford House. As Head of School Rick Hardy remarked, the day was an opportunity to show great gratitude for the “extraordinary progress and momentum” that this community, together, has championed and helped to make possible. CA Dance Project performing at the Gathering in Gratitude celebration. 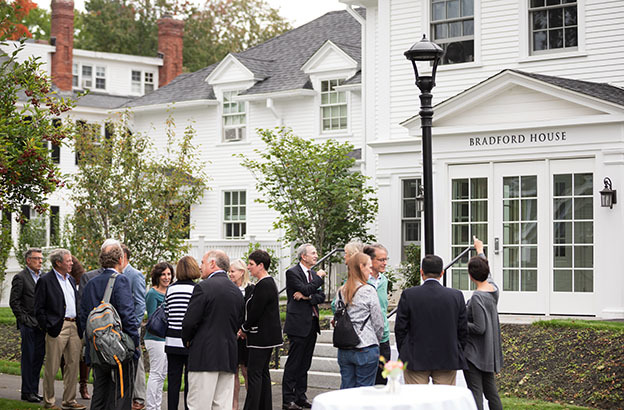 Earlier in the day, two dedication ceremonies for new common rooms in Concord Academy’s residential houses celebrated CA’s past, present, and future. A luncheon program in the recent addition to Bradford House — now the Sylvia M. Mendenhall Common Room — gathered leadership donors to the CA Houses initiative to commemorate the legacy of longtime English teacher Sylvia Mendenhall, whose dedication to the school spanned more than three decades, continuing long after her official retirement in 1992. When she passed away in 2016, Concord Academy was notified of Mendenhall’s bequest of her private home in Chelmsford, Mass., the sale of which provided the funds to make possible this common room that is already drawing the community closer together. 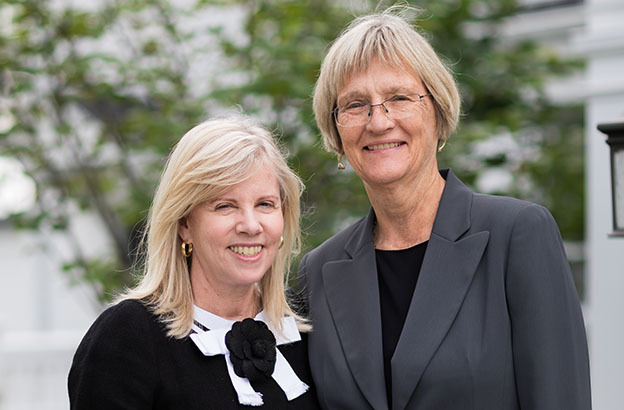 Drew Gilpin Faust ’64, recently retired president of Harvard University, spoke movingly about Mendenhall as a life-changing mentor and about her quiet but powerful influence, one that endures in the character of everyone who knew her, as well as in the character of CA to this day. Common themes of reminiscences about Mendenhall were her infectious energy and tireless enthusiasm for unearthing what was possible from a paper, and thus from every student. Bruce Beal ‘88 remarked on how powerful this was for him as a student, a sentiment many in the room shared. 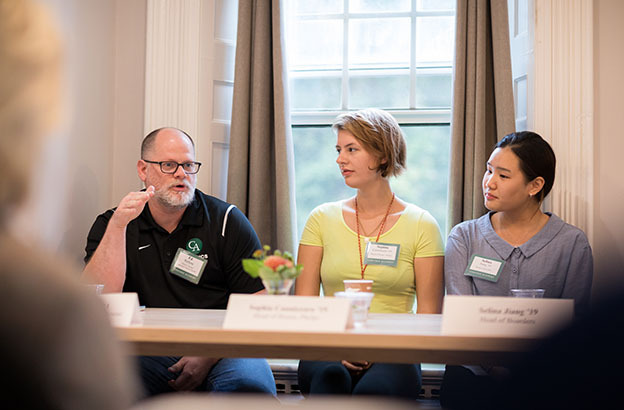 A panel discussion with student members of CA’s Boarding Council and house faculty in the new Stone Soup Common Room in Phelps gave boarding student leaders and house faculty an opportunity to share how CA’s residential life program has influenced them personally. 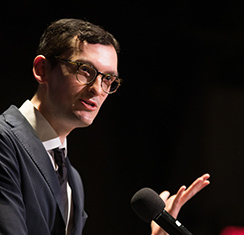 Board member Sean Dalton P’16 ’19 began by sharing that the common room name had been chosen by that year’s boarding council — a name they found fitting for the contributions that everyone makes to the collectively rich experience of CA. Boarding Council members and CA house faculty during the dedication of the Stone Soup Common Room in Phelps. In panelists’ remarks, CA’s balanced focus on individuality and community, on diversity and inclusivity, was amply evident. Sophia Cannizzaro ’19, head of house in Phelps, spoke of a culture of willingness to share that naturally deepens understanding of different backgrounds and cultures. Thomas Teunissen ’19, head of house in Bradford, talked of learning from disagreements with roommates and the leadership of older students. 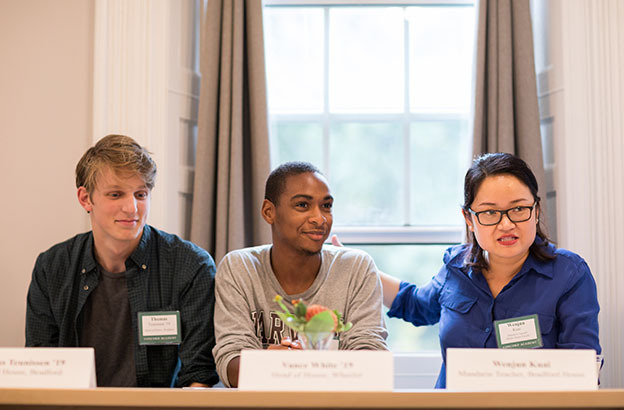 Selina Jiang ’19, head of boarding students, discussed the importance of the host family program and an environment in which students are encouraged to learn from mistakes. Vance White ’19, head of house in Wheeler, spoke of the chance to give back as a mentor. 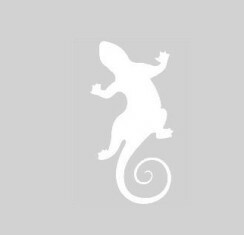 “Everything comes back full circle as a boarder at CA,” he said. House faculty Ed Rafferty and Wenjun Kuai praised the interactions that the new common rooms have enabled, the ways in which the inviting, spacious rooms facilitate multiple activities and are encouraging students not only to assemble regularly but to stay and build authentic community together. This day of celebration focused on people — the students, boarding and day alike, who benefit from CA’s residential life program; the faculty who serve as role models; and just as importantly, the loyal investments of a large, and growing, community of supporters whose leadership, vision, and generosity have infused Concord Academy and the Centennial Campaign with the passion, energy, and momentum that will carry the school into its second century strengthened and emboldened.